Social enterprise acquisitions have been the all the rage in the last year. But if you want to find the next big acquisition target, consider gamification startups. Bunchball founder and Chief Product Officer Rajat Paharia told me he expects it won’t be long before gamification companies will be buyout targets soon by the SAPs (s sap), Oracles (s orcl), Microsofts (s msft) and Salesforces (s crm) of the world. Obviously, he has a vested interest in this, but there are some compelling reasons for why this theory may come true in the near future. Gamification, with its reliance on points, badges, leaderboards and rewards, appeals to some basic human desires for fun, competition, interaction and achievement. The concept has been around for year and has been traditionally used to incentivize consumer behavior; think of frequent flyer programs and other loyalty systems. But corporations are increasingly seeing this as an effective way to get more productivity out of workers. As more work moves online and goes virtual, firms are looking for new tools to encourage their employees and push them toward their goals. Zichermann doesn’t think there will be a lot of immediate acquisitions of gamification startups this year. But in the next 12-24 months, he believes big enterprise companies will start to make moves in this space as their top executives realize the strategic benefits of gamification. For many big software companies, adding gamification can complement social collaboration tools such as Yammer and Chatter and can work alongside existing HR performance software and customer relationship management programs. It can become part of a complete suite of services that software companies offer their clients, who want to engage both consumers and their own workers. Many of the big players are already making investments in this area. Salesforce last year bought Rypple, a social performance management platform that employs game mechanics. IBM (s ibm) has been working on its own product called Innov8, which has been effective in generating leads and traffic to its website. Gartner has predicted that by 2014, more than 70 percent of Global 2000 organizations will have at least one “gamified” application and half of organizations that manage innovation processes will gamify those processes by 2015. While some companies are already dabbling with their own in-house gamification efforts, many other enterprise companies are turning to startups like Bunchball, Badgeville, BigDoor, Gigya and others to implement game mechanics into their processes. Paharia, who founded Bunchball in 2007 before the term “gamification” took hold, said his company now has more than 200 customers including names such as Warner Brothers (s twx), Comcast (s cmcsk), Hasbro, Mattel and others. About 90 percent of the business through the end of last year was selling to corporate customers, who used gamification to engage consumers. But now, about 35 percent of Bunchball’s deployments are for companies using game mechanics to motivate enterprise workers. He said enterprise software companies and their customers are realizing that gamification can be an effective tool in addressing the constant struggle over getting workers to use software. “They’re all making software but whoever figures out how to get their software used regularly will win. It’s a problem of motivation,” he said. A year ago, Bunchball introduced a product called Nitro for Salesforce’s AppExchange, giving Salesforce customers an easy way to add on gamification tools. Bunchball has also teamed with Jive to integrate its game mechanics into Jive’s social business platform. 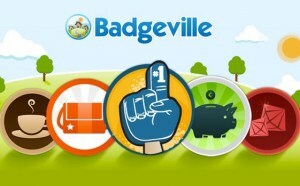 Rival Badgeville has partnered with Yammer to improve employee performance and launched its own program to integrate with enterprise software applications from Jive (s jive), Omniture (s adbe) and Salesforce.com. The big question is will the big enterprise software players be content to partner with gamification startups or will they seek to buy the technology or try to build it themselves. If these companies can develop the gamification knowhow in-house, that could keep them from looking to acquire any of the dedicated gamification startups. Gamification still faces plenty of hurdles. It will need to prove it can produce consistent, tangible results. And it will also need to overcome the skepticism of critics, who see a lot of hype and buzz in the concept. Many still see gamification as a passing fad or old methods dressed up in new terminology. But if this crop of gamification startups continue to win over corporate customers and prove their worth in the enterprise, don’t be surprised if we see them get snatched up in the next couple years. How can gamification beat the ‘cheating’ – the people who game the games? It’s time to bring it to the masses, and that’s exactly what we do at http://GetGamified.co.uk.